Hasegawa 1/72 Ki-84 'Hayate' "Metropolitan Defense"
Design of the Ki-84 commenced in early 1942 to meet an Imperial Japanese Army Air Service requirement for a replacement for Nakajima's Ki-43 Hayabusa, just entering service. The specification recognised the need to combine the manouverability of the Ki-43 with performance to match the best western fighters and heavy firepower. The Ki-84 first flew in March 1943. Although the design itself was solid, the shortage of fuel and construction materials, poor production quality, and lack of skilled pilots prevented the fighter from reaching its potential. A total of 3,514 were produced. The Ki-84 addressed the most common complaints about the popular and highly maneuverable Ki-43: insufficient firepower, poor defensive armor, and lack of climbing power. The Ki-84 was introduced with two 12.7 mm (.50-in) machineguns and two 20 mm cannons, a considerable improvement over the single 7.7 mm and single 12.7 mm machine guns of the Hayabusa. Defensive armor offered Hayate pilots better protection than the unsealed wing tanks and light-alloy airframe of the Ki-43. In addition, the Ki-84 used a 65 mm armor-glass canopy, 13 mm of head and back armor, and multiple bulkheads in the fuselage, which protected both the methanol-water tank (used to increase the effectiveness of the supercharger) and also the centrally located fuel tank. It was the powerplant that gave the Hayate its high speed and prowess in combat. Derived from the Homare engine common to many Japanese aircraft, the Hayate used a direct-injection version of the engine, using water injection to aid the supercharger in giving the Ki-84 a rated 2,000 hp at takeoff. This combination—in theory, at least—gave it a climb rate and top speed roughly competitive with the top Allied fighters of the late Pacific theater, the P-51D Mustang and P-47D Thunderbolt (with top speeds of 433 and 426 mph, respectively). Initial Hayate testing at Tachikawa in early summer 1943 saw test pilot Lt. Funabashi reach a maximum level speed of 634 km/h (394 mph) in the second prototype, but after the war a captured example was tested by the U.S. Army using high-octane fuel and achieved a speed of 690 km/h (430 mph). The complicated direct-injection engine, however, required a great deal of care in construction and maintenance and, as the Allies advanced toward the Japanese homeland, it became increasingly difficult to support the type's designed performance. Compounding reliability issues was the Allied submarine blockade which prevented delivery of crucial materials for construction of components such as the landing gear. Many Hayates consequently suffered strut collapses on landing. This is another Hasegawa kit that is approaching classic standards. First issued in 1987, the kit has mostly raised panel line detailing, a very basic cockpit with but a somewhat generic seat, floor control stick and a clear plastic instrument panel. A decal is to be placed over this. Even for 1994, the mold suffers somewhat from flash on a few parts. The usual ejector pin marks on gear struts and gear doors, a passable engine front and a one-piece canopy section. The only options are drop tanks and those really are not options as there are holes already drilled in the wings for them. It is not a complex kit. 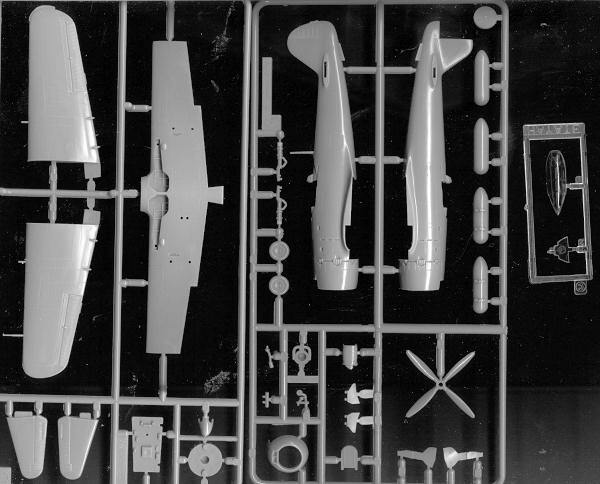 Instructions are standard Hasegawa with Gunze and generic paint references. You'll have to mix the upper surface colors and while the underside is shown as a light grey, it may also be unpainted metal. 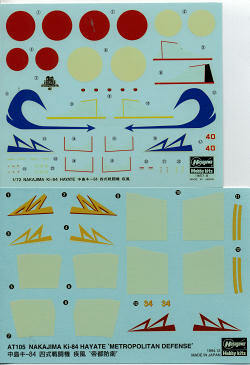 An addendum sheet shows the new decal markings for this limited reissue. One uses most of the bits from the original decal sheet to do one of two aircraft from the third squadron of the 47th Sentai. Aside from one having command bands around the fuselage and the other having a rudder number, they are basically the same. The decals are 'old school' where the whites are off white and they will probably not like setting solutions. However, they do provide the white 'bandages' for the wings and fuselage. Leading edge ID bands will need to be painted on as with the anti-glare panel. You are provided a set of blue tail markings for the second squadron though no additional information. The original decal sheet has first squadron markings so one could really do any aircraft from the 47th if one has a reference for it. AThose of us who have built this kit in the past know that it really is one of the easier kits to build. Pretty much hassle free and as long as you aren't squeamish about raised detailing, it is a kit that I know you'll enjoy building. Detail fans will want the True Details cockpit for this as it really spruces things up. Though not currently in the catalogue, these kits are by no means difficult to find. I had a bout of nostalgia so bought this one and shared it with you.